By Pablos Holman, hacker, futurist and inventor, Intellectual Ventures Lab. Can we learn something about how the open source communities work? Could their collaborative way be somehow extrapolated into how we work in a company? 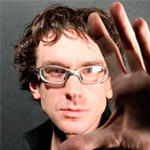 A hacker and inventor at Intellectual Ventures Lab — a prototyping and research laboratory aimed to invention and discovery —, Pablos Holman reflects about what some companies are doing wrong in order to motivate their employees, and what are the different approaches when facing a project. You can check his thoughts in the short video below. His contribution was possible thanks to the kind collaboration of the 4 Years From Now event. How many peers does it take to light the world? By Geoffrey Moore, author, speaker and advisor. When confronted to the main question of this blog, I would rather rephrase it to this one: How many peers does it take to light the world? The new collaborative economy is organically more altruistic and philanthropic than our current language of business knows how to process. Thus when we ask an operational excellence question of a disruptive innovation, we create humor, but perhaps not insight.